A breakthrough in style and functionality, the V Series of luxury performance motoryachts offers a modern take on a classic design, with sleek exterior lines and stylish expanses of glass atop a proven hull form. 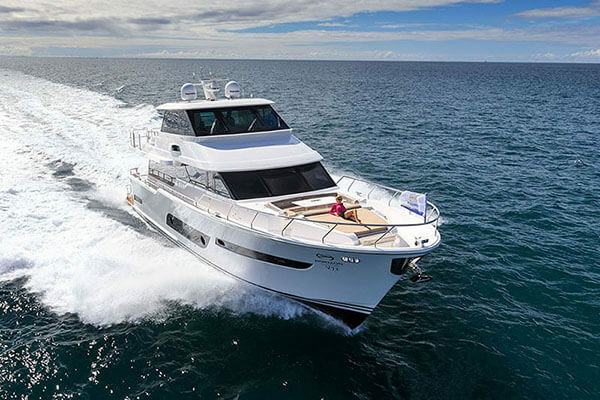 One of the original Horizon series of luxury motoryachts, the V Series has evolved over the years to incorporate more amenities and options for customization to suit active yacht owners. This series is equally suited for the avid angler, the owner/operator, and the watersports enthusiast, as well as the yachting family who enjoys a fully crewed luxury yacht. From the entry-level V68 luxury motoryacht-developed in collaboration with designer Jonathan Quinn Barnett and featuring a high-performance plumb bow and hull design by Stimson Yachts-to the luxury V80-outfitted with a fully-equipped fishing cockpit-each yacht in the V Series is offered in either an Open Bridge or Enclosed Bridge configuration and features a wide beam, advanced hull design, and many options for customization.